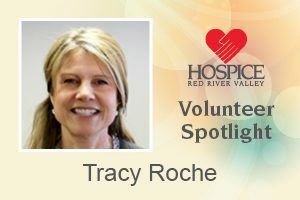 Why do you work as a volunteer coordinator for Hospice of the Red River Valley? I have grown to love the mission of serving people in my community with their end-of-life needs. One of my favorite parts of my job is meeting people whose family members were served by our volunteers. A special volunteer program that’s near and dear to my heart is our Celebration Bears program. I can’t think of anything better than meeting with one of our volunteer sewers as they give the family members the bears they have sewn out of a patient’s clothing. These bears bring so much joy to our patient’s families. Many volunteers tell me they find themselves getting quite attached to the bears they sew, and some even share that they pray for the patient and their family as they construct these bears. Tell us about one of your favorite experiences as a volunteer coordinator. I really get a kick out of listening to our volunteers share stories of their interactions with patients. I especially enjoy reading the handwritten notes from volunteer visits and sharing this information with the care team. 1. I try hard to find the good in each thing that happens in my life even if at first it appears to be negative. A dear friend of mine has shared this trick with me, and I have found it to be a rewarding way to look at events in my life. 2. Finding and maintaining balance in my life. I enjoy spending time with my four daughters, my husband Tim, and our family dog Lenny. In my spare time you can find me knitting and gardening, and recently I am finding joy in learning about African violets.